The Middle Eastern dip and spread Baba Ghanoush is traditionally made with baked or roasted eggplant, garlic and olive oil. Many countries have their own variations of this dish. Here’s the raw food version, with the eggplant uncooked, of course. Place sliced eggplant in a bowl of water with salt and lemon juice to soak overnight. Drain. Place it in a food processor together with garlic, cumin, lemon juice and salt. 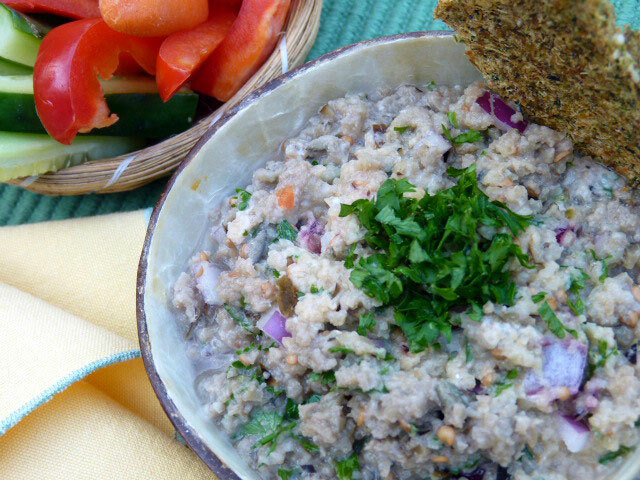 Transfer to a bowl, add chopped parsley, onions, tahini, oil, adjust salt and mix well. Serve with crackers or vegetable crudités.